The parents of a three-year-old have been left heartbroken after finding out their son’s new smile was actually a brain tumour – leaving the youngster with just months to live. Wesley Lacey (28) and Rebecca Oldham (29) were told last week their toddler Jack has between six months and year to live after being diagnosed with a diffuse pontine glioma (DPG) – an aggressive brain tumour. The couple had noticed their son had developed some new habits – including a smile which only used one side of his face – but didn’t think anything of it. It wasn’t until Jack also developed a blink and night terrors and then started to walk with his hands in front of him, feeling his way around, that the family from South Yorkshire, England, decided to take him to a doctor. “We didn’t take any notice because it was so gradual, we just thought it was a bit funny, but this is his new smile,” the boy’s father, Wesley, said. “But Jack has been riding his bike since he was one, so to see him walking like that, I just knew something was wrong,” he added. “All of these symptoms came on within a four-week period and they weren’t obvious things. Doctors at Sheffield Children’s Hospital told Jack’s parents after a CT scan that the aggressive tumour was terminal. He's since had a biopsy and a treatment device fitted to fight the tumour – but doctors have given him just six to 12 months to live. “This news has been the darkest time of our lives, I can’t even begin to think about him not being there. The tumour he has is a known fast, aggressive killer,” Wesley said. “The crazy thing is that the symptoms came about in the last four weeks, however we've been told that the tumour has been growing for many months without symptoms. 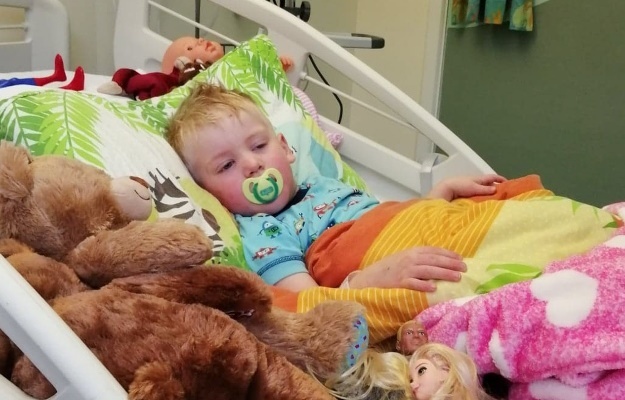 Jack is at home with his parents and two-year-old sister and the couple say his personality is slowly changing due to the medication he is on. They’re raising money to help towards funeral costs, and to give Jack some days out during the time he has left. “He was always a loving boy but now there have been times where he’s absolutely crazy, with shouting and swearing from the drugs he’s been given. The steroids have made him aggressive,” Wesley said. “Our little boy deserves to spend as many days as he can, enjoying what time he has left and as you can imagine, we all had so many plans. “We want to use the money to fund day trips, holidays, presents, meals out. “We also want to take him to the cinema for the first time and buy him a dog. Jack’s already said he wants to call him Waffle. “We don’t want to think about this but it will also fund his funeral. He never stops talking, joking and will play his little heart out, even when sick, as we have recently seen.